His joke is a reflection on a sad occurrence for most of us this time of year. We have the best intentions about setting goals and making new year’s resolutions for change but in a short period of time, they fall flat and by the way side. Have you ever wondered why? I know I have. If I am a determined person who when presented with a task rarely if ever gives up, am known for my tenacity, and my propensity for finishing what I start, then why is it so hard for me to keep New Year’s resolutions? I know I am not the only one out there with this challenge. It hit me this year like a rather large ton of bricks…or perhaps the overload of turkey, ham, stuffing and other goodies finally got to me. I wasn’t planning my resolutions S.M.A.R.T. and my heart had not bought in on the idea. In my Mary Kay business, I had learned about the acronym S.M.A.R.T. a long time ago and its importance in goal setting. I use it not only in my business when setting yearly, five year and ten year plans, but also in the majority of the personal goal setting and planning I do for myself and my family. BUT, I have never applied it to a New Year’s Resolution. To be honest, I am not sure WHY I haven’t. Resolutions are goals just like any other goal I set. In reality any time we start a sentence with the words “I should” our hearts are just not in it and you really need to finish it with the truth… “but I’m not.” When our hearts are not in something, then we really are not motivated to do it. So I think the first part of goal setting, whether that is for work or for New Year’s Resolutions, is to get your heart involved. If you think you should eat healthier, exercise more, lose some weight but you are starting with “I should”, ask yourself why you think you should? Or why would I want to? OR the golden question that moves all adults to act – what’s in it for me? Getting Healthy is one of mine this year. Getting a little vulnerable here, I have always struggled with weight issues due to my childhood and becoming an obsessive compulsive overeater as a coping mechanism. About 11 years ago on my own without assistance of medication, a weight loss program or surgery I lost a whopping 160lbs. I went from a size 22W top and 24W bottom to a 0-2 on top and a size 4-6 on my bottom. Yep. I worked to repair the emotional damage I sustained and that helped me easily shed the physical manifestation of that. (I will not lie, when pushed into a corner that is still my coping mechanism.) And I maintained this loss with a little fluctuation every now and then of about 10lbs up or down for over 10 years. Then right before my wedding my health challenges of Interstitial Cystitis and Irritable Bowel Disease, which were acting up, were joined with a thyroid problem. For anyone who has thyroid issues, you know that weight and health can be a challenge. I literally had months where I lived off of a 500 calorie diet and STILL GAINED WEIGHT. Ugh! I think I am the only person who I know that diligently followed Weight Watchers and gained weight! Talk about depressing. So this year, I am tackling my health. But losing weight is a “should” for me, not an “I must, I can, I will”. So I started to ask myself why I would want to lose weight and focus on my health because while I desperately miss my massive wardrobe and hate my flare days, I am actually quite comfortable in my skin. I like me. However, I do HATE having an outfit in my closet for every occasion and yet having to buy new clothing because nothing fits. I HATE how tired the thyroid, IC and IBD make me and how that can impact me on what I want to get done in a day or frankly even working. I want to start having children with my husband and the thought of not being able to run with them, to keep up with them or having even less energy than I do scares me and frankly makes me angry. Plus, I love the pictures of how I looked when I was healthier and, yes, thinner. So now my heart is definitely involved. Ask that about your “shoulds” and see if you can engage your heart. When it’s involved the odds that you will stick to your resolution drastically increase. Are Your New Year’s Resolutions S.M.A.R.T.? My first New Year’s Resolution this 2014 is to be healthier but really that’s not specific enough, nor is it measureable. So I defined what “Being Healthier” looked like to me. Resolution #1 – Get Healthy. This means getting back down to my healthy weight of 135-145, focusing on losing 2-3 pounds a week until I reach my goal. (Yes I am telling my weight. I know a cardinal sin amongst women.) When I was at this weight range I not only looked good but I felt my most healthy – more energy, no ravenous appetite, nor starving, not winded or tired all the time, etc. Eating and incorporating macrobiotics (vegan) back into my meals for at least breakfast and lunch and creating dinners that allowed me to enjoy healthy vegetarian options while still able to accommodate the desires for various meat proteins for my son and husband. (I have always found it harder for my body to process animal proteins and products but that is just me. Your healthy may look different.) Not only meal planning dinners but also meal planning and prepping my lunches, breakfasts and snacks. Also prepping where I can in advance so I can just grab and go. Exercise a minimum of 30 minutes daily but to stretch to reach for 1 hour at least 5 times a week with both yoga and cardiovascular exercise. Gain more energy from all of these efforts. Lastly, to listen to my body and work with my doctor to determine the best courses of action to manage the three health challenges I currently have. Here is how my resolution to “Get Healthy” moved into being S.M.A.R.T. Specific – I would say that “Get Healthy” just got very specific. I have defined exactly what getting healthy looks like to me. Weight loss. Eating more vegetarian. Daily Exercise. Focusing on managing my health challenges. Gaining energy. Measurable – “Get Healthy” is measureable since I created benchmarks and specific items I was looking to achieve. For example – I gave a number to the weight I wanted to lose. In this case down to 135-145 AND a benchmark to focus on of 2-3 a week. Also, “Get Healthy” can be measured by tracking do I exercise at least 30 minutes daily? Are my meals planned out? Do I make an appointment to see the doctor (which I actually already have)? 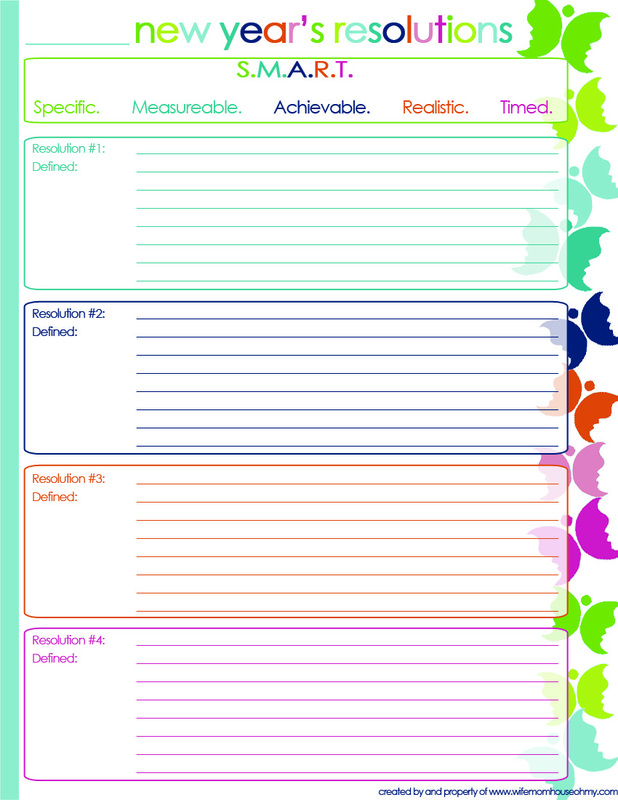 Achievable – Can I truly accomplish the goal I set? I would say in this case…Yes! There is nothing that I have defined in my “Get Healthy” New Year’s resolution that is remotely out of reach. It will require me to stretch and be a much more active participant in my getting healthy but it is achievable. However, if I said I wanted to exercise 2 hours daily, make my family eat macrobiotically, eradicate my health challenges, those really are not achievable in my current life. I would fail. Realistic – From where I am now to reaching the 135-145 weight at a 2-3 pound a week weight loss is extremely reasonable and if I stay on track, I should complete it well before the end of 2014. However, if I were looking to lose 200 pounds, which I am not, by 2015, I would say with the method I am choosing that is not realistic as it takes 66-67 weeks to lose 200 pounds at a rate of 3 pounds a week. I would say focusing on a minimum of 30 minutes a day is realistic given my current life. Wanting to successfully complete an Iron Man by the end of 2014 in my current health state would not be. One last thing with respect to creating New Year’s Resolutions. I think we often make these big lists of the things we want to improve about ourselves or change and the size of the list itself becomes OVERWHELMING! It is easy to give up on them and give up on them quickly when you are trying to change so many things. I suggest writing all your ideas down on a dump list. Then pick 2 or 3 but no more than 4 that you want to focus on this year. The others may fall in line as I have found they are often fairly similar but if they are not, then you can look at them next year. 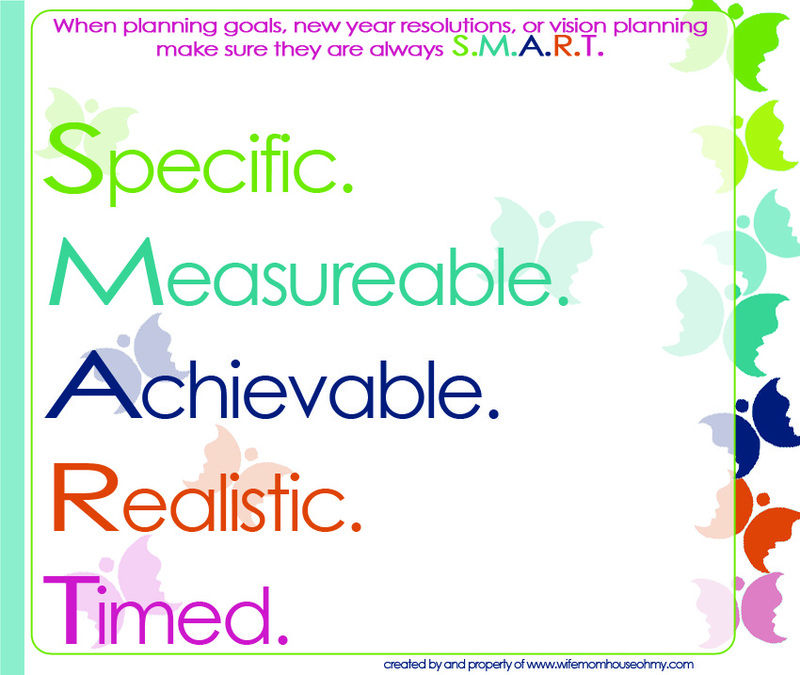 I have attached my little plan sheet I am using for my New Year’s Resolutions so you can start your own S.M.A.R.T. New Year’s Resolutions and finish them this year! Remember, if you get your heart involved and plan S.M.A.R.T. New Year’s Resolutions, you are setting yourself up for total success! I’d love to hear what some of your resolutions are this New Year’s! Posted in Holiday, Mom, Organization | Tagged New Year Resolution, S.M.A.R.T. Thank you. I am glad you liked it. I hope it was helpful.